Killing Floor is one of my go-to games, a title that survives every formatting and OS reinstall of my main PC gaming rig. When I want FPS cooperative action, it’s always the first choice on my Steam favorites list, the sort of game that I’m never really done with no matter how many victories (or defeats) I rack up. At least that was the case until Killing Floor 2 was announced. After getting my hands on the beta/Steam Early Access version to play around with, I can tentatively walk away with two conclusions. First, Tripwire Interactive managed to improve upon Killing Floor 2 while keeping everything I loved about the original. And second, no matter how much people complain about there being ‘too many zombie games’, it’s still immensely satisfying to gun down dozens upon dozens of the shambling, hostile undead. Some things just never get old. Do zombie-making research labs go looking for fat corpses, or do they make their own? For those of you who aren’t familiar with the original game, here’s some background information. While Killing Floor 2 has a semblance of a story to it (zombie weapon research goes haywire, they swarm the streets and turn the UK into a quarantined battlezone), this is not a game with a real ‘story mode’ to speak of. Unfortunate, and sometimes a deal-breaker. But what Killing Floor 2 lacks in single-player excitement, it more than makes up for in terms of gory cooperative zombie-slaughtering fun. The gameplay is straightforward: FPS action featuring progressively more difficult waves of horrific undead for you and your team to face. Killing each undead nets cash you use to spend between rounds, repairing armor, buying new weapons, and restocking precious, precious ammo. Your kills also result in experience for your chosen character class (of which ten are planned for eventual release), improving statistics such as weapon damage, weapon accuracy, ammo count, etc, while also unlocking one of two class buffs every 5 levels. While the cash doesn’t stick around from one game to the other, the experience does – meaning that over time you’ll be growing each of the classes you play to greater stages of badassitude, which in turn will have you ramping up the difficulty to draw in even greater challenges. Killing Floor 2 largely sticks to the script of the original in terms of gameplay – while some of the planned classes are new, as is the extension of the level-up system and the addition of the aforementioned buff choices every 5 levels, everything feels very familiar, in a good way. Graphically the game’s been enhanced and pulled forward in terms of graphical presentation – no longer is the most horrifying thing about these creatures their low polygon count. Now you’ve got a zoo of monstrosities with updated skins and models, all shown off in their blood-soaked, fang-laden, body-horror glory. The gameplay styles of the original game are represented as well, even at this stage of the game – shotgun-toting support action is back, along with team healing, door-barricading, and of course the serverwide headshot-provoked slowdowns that gives everyone a moment to line up some incredibly painful shots on the oncoming swarm. The main change thus far is the end boss – gone is the Patriarch, replaced instead by some extremely cocky, chatty german-accented doctor with a prescription for pain. It’s hammer time! Haha. Do you guys get it? No? Wow I feel old. So far, it’s looking like fans of the original Killing Floor who principally wanted the same basic gameplay with a whole lot of enhancements (graphical and otherwise) will be pleased. But for those of you who never gave the first Killing Floor a chance, let me explain what the draw here is. First, there’s the progression. For me, this was the game I picked up after playing the Left 4 Dead series and getting tired of it too quickly. The weapon variety was far too thin, the confrontations generally felt overwhelming to the point of punishment rather than challenge, and every new game started you off back at square one. In Killing Floor, even if you get utterly wiped out by the zombies, you’re still generally gaining experience – creeping your way towards more powerful stats, enhanced weapons, even some new abilities. It gives you something to shoot for other than simply trying to win your current round. With Left 4 Dead, getting to the very end of the story mostly finished the game for me. 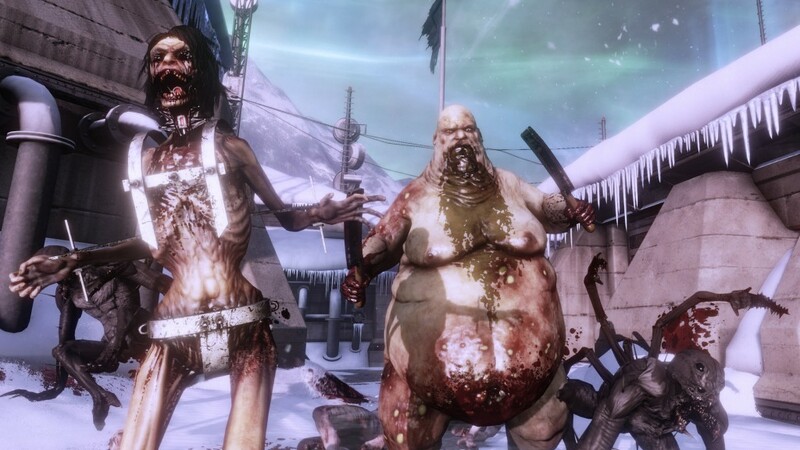 With Killing Floor, it’s just a milestone in what can and will be a long, challenging, fun experience. In this way the game feels like a gore-heavy version of Payday 2, but with a faster pace and no stealth options. But even if progression is a good carrot, it’s not going to mean anything if the game doesn’t entertain – and that’s where Killing Floor 2 (and its original) really shine. What I noticed about both games is that every round I played ultimately felt both fair yet challenging. This is a game where, if you turn around and find yourself suddenly facing an incredible horde of zombies, it’s your own damn fault for not having a pair of eyes aimed in that direction to warn everyone – the enemies generally spawn far away and shamble towards you, making awareness of your surroundings paramount. Ammo is usually just plentiful enough to supply the confidence needed to face a fresh round of enemies, but it can quickly turn into just-not-enough if you’re wasteful. You quickly find yourself aiming for headshots with your pistols and rifles, and waiting for appropriately large crowds (or dangerous threats) to use your shotgun against. All it really takes is one or two moments where you’re desperately hacking at too-many-enemies with your knife, or finding yourself surrounded and unable to fight your way to safety, to teach you the subtler parts of dealing with the enemy. The result is that Killing Floor 2 is a game where success feels satisfying, where you can generally be confident that you’re lasting longer and longer not just because you’re more powerful, but because you and your friends have learned how to play and are putting those lessons to work. Spider-Man, Spider-Man, doing jazz-hands like a spider can. As it stands, for a game that’s still in Steam Early Access, Killing Floor 2 feels closer to ‘done’ than the norm. I hardly encountered any bugs while playing – save for now and then having a round that just wouldn’t end due to a monster being ‘stuck’ somewhere (you need a complete slaughter to end the wave). As of when I last played, only four classes were active, as well as only a couple of maps – far short of the eventual content aim the title is shooting for. But as it stands, this was a great experience. Killing Floor 2 promises to be every bit as addictive as its original, improving not just graphics, but progression as well. If you and your friends have been looking for a game you can all play together cooperatively, be sure to check it out.